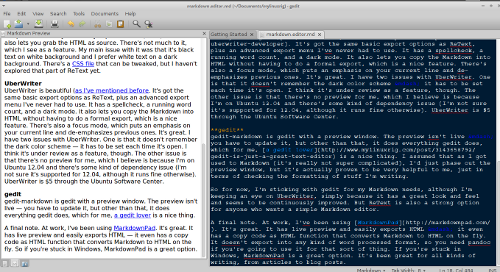 Which open source markdown editor has all the right features? I eventually narrowed my list to three: ReText, UberWriter, and gedit-markdown. When choosing software, I can usually tell if something will work for me in the first hour or so of use. All three of these editors were very usable to me, which is why I wound up needing a bake-off. I still haven’t really picked one, although I do spend the most time in gedit, mostly because it’s where I do everything. And even as I’ve gotten a handle on Markdown, I appreciate the preview all three provide, just to get a sense of how the final product will look. UberWriter is beautiful (as I’ve mentioned before). It’s got the same basic export options as ReText, plus an advanced export menu I’ve never had to use. It has spellcheck, a running word count, and a dark mode. It also lets you copy the Markdown into HTML without having to do a formal export, which is a nice feature. There’s also a focus mode, which puts an emphasis on your current line and de-emphasizes previous ones. It’s great, but I have a few issues with UberWriter. One is that it doesn’t remember the dark color scheme—it has to be set each time it’s open. I think it’s under review as a feature, though. There’s also no search and replace ability, although that’s also on the roadmap. Another issue is that there’s no preview for me, which I believe is because I’m on Ubuntu 12.04 and there’s some kind of dependency issue (I’m not sure it’s supported for 12.04, although it runs fine otherwise). 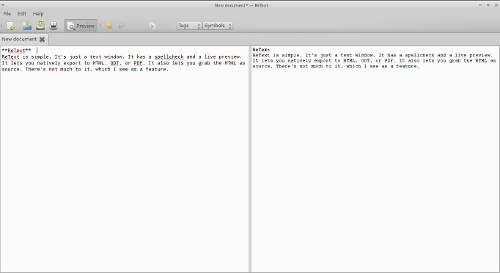 UberWriter is $5 through the Ubuntu Software Center and despite those few issues, it’s well worth the money. gedit-markdown is gedit with a preview window. The preview isn’t live—you have to manually update it, but other than that, it does everything gedit does, which for me, a gedit lover, is a nice thing. I assumed that as I got used to Markdown (it’s really not super complicated), I’d just phase out the preview window, but it’s actually proven to be very helpful to me, just in terms of checking the formatting of stuff I’m writing. So for now, I’m sticking with gedit for my Markdown needs, although I’m keeping an eye on UberWriter because it has a great look and feel and seems to be continually improved. But ReText is also a strong option for anyone who wants a simple Markdown editor. Originally posted on My Linux Rig. Reposted using Creative Commons. There isn't a word in that opening sentence that I don't like. Incidentally, do newer versions of ReText export your semantic markup? The version I used did not; it spit out .odt files with manually formatted heading and body text. You should check out http://stackedit.io/, which is an in-browser Markdown editor that uses local storage for storing your documents. It's one of the nicest Markdown editors I've seen, and has integration with Github, Google Drive, and Dropbox. Having used all three quite extensively, UberWriter scores the highest marks with me. Mainly because of its export/conversion options (via Pandoc). That's not to say ReText and gedit with Markdown support are slouches, either. They're not. All three are great tools. UberWriter is great. I think my issues are solely because I'm running an older Ubuntu. But you're right -- all three are fantastic. I had some issues in an older version of Linux Mint, too. 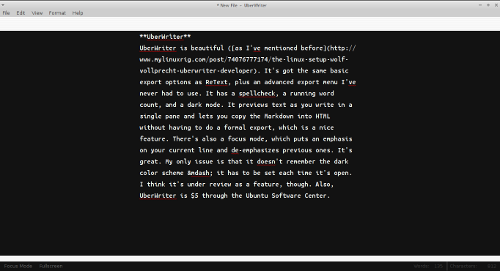 But in version 15 of Mint, and in the latest version of Lubuntu (which I'm using now), UberWriter works beautifully.